Need service for you garage doors in Friendswood TX? Look no further than the local experts at Henderson Garage Door. Since 1989, we have been serving the community in the sale, installation, and repair of residential and commercial door systems. Customer service has always been our first concern and will remain the number one concern as long as we are in business. Unlike other garage door companies, we don't work with sub-contractors to get the job done. When you call Henderson, you'll receive help from trained and insured technicians that work directly for us. We take our work seriously at Henderson, and we make sure that we are in control of the services that we provide to customers. We're proud of our reputation for prompt, professional, and reliable service and we'd like to welcome you to the Henderson Family! We were totally impressed with the whole process from the quote to the finished job. 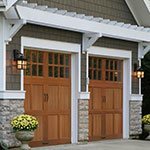 — Frank B.
Henderson Garage Doors is a leading provider of residential and commercial garage doors and openers for Baytown TX & the Greater Houston Texas area.